The mechanics of dragonfly flight are unique: dragonflies can manoeuvre in all directions, glide without having to beat their wings and hover in the air. The mechanics of dragonfly flight are unique: dragonflies can manoeuvre in all directions, glide without having to beat their wings and hover in the air. Their ability to move their two pairs of wings independently enables them to slow down and turn abruptly, to accelerate swiftly and even to fly backwards. 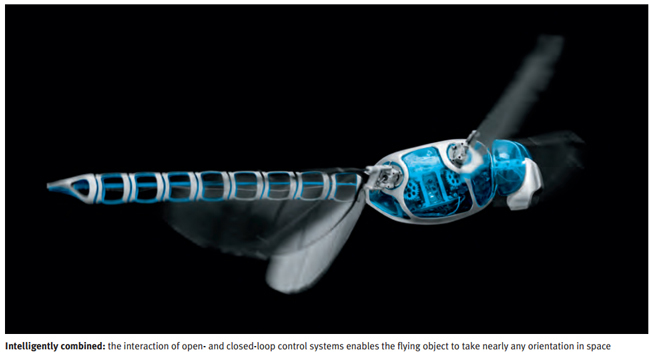 With the BionicOpter, Festo has applied these highly complex characteristics to an ultra-lightweight flying object at a technical level. For the first time, there is a model that can master more flight conditions than a helicopter, plane and glider combined. In addition to controlling the flapping frequency and the twisting of the individual wings, each of the four wings features an amplitude controller. This means that the direction of thrust and the intensity of thrust for all four wings can be adjusted individually, thus enabling the remote-controlled dragonfly to move in almost any orientation in space. The intelligent kinematics correct any vibrations during flight and ensure flight stability both indoors and outdoors. The unique flight behaviour is made possible by the lightweight design of the model dragonfly and the integration of its functions: sensors, actuators and mechanical components as well as communication, open and closed-loop control systems are installed in a very small space and connected to one another. Despite its complexity, the highly integrated system can be operated easily and intuitively via a smartphone. The flapping frequency, amplitude and installation angle are controlled by software and electronics; the pilot just has to steer the dragonfly – there is no need to coordinate the complex motion sequences. The BionicOpter was developed as part of the Bionic Learning Network. Together with colleges, universities and development companies, Festo has spent many years developing and supporting projects and test models whose basic technical principles are derived from nature. Whether it is energy efficiency or lightweight construction, the integration of functions or the ability to learn and to communicate, throughout evolution, nature has developed a wealth of optimisation strategies for adapting to its environment, and these strategies can be applied to the world of engineering. 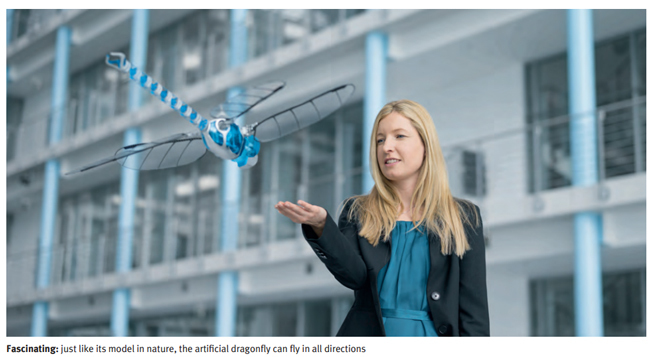 After bird flight had been deciphered with the SmartBird, the developers took on their next-biggest challenge: modelling the dragonfly at a technical level – with even more functions and even less weight. With a wingspan of 70 cm and a body length of 48 cm, the model dragonfly weighs just 175 grams. The wings consist of a carbonfibre frame and a thin foil covering. The structure is made of flexible polyamide and terpolymer. This makes the entire system flexible and ultralight, but still sturdy. The small ribcage houses the battery, nine servo motors and a high-performance ARM microcontroller, all installed in the smallest of spaces just like the sensors and wireless modules. Up and down, forwards, backwards and to the side: the flapping wing design of the BionicOpter enables it to fly in all directions in space and hover in mid-air just like a helicopter. Unlike a helicopter, however, the dragonfly does not need to tilt forwards to generate forward thrust. This means that it can fly horizontally as well as float like a glider. Its lightweight design means it is able to start autonomously. All these manoeuvres can be executed with ease using a smartphone. During operation, the remote-control system simply transfers the signals that tell the object which direction to fly in and at what speed. The microcontroller calculates all the parameters that can be adjusted mechanically based on the recorded flight data and the pilot’s input. The processor actuates the nine servo motors to translate these parameters into movement using beat frequency, a swivel device and the amplitude controller. A motor in the bottom part of the housing provides the drive for the common beat frequency of the four wings, which is adjustable between 15 and 20 Hz (1st degree of freedom). 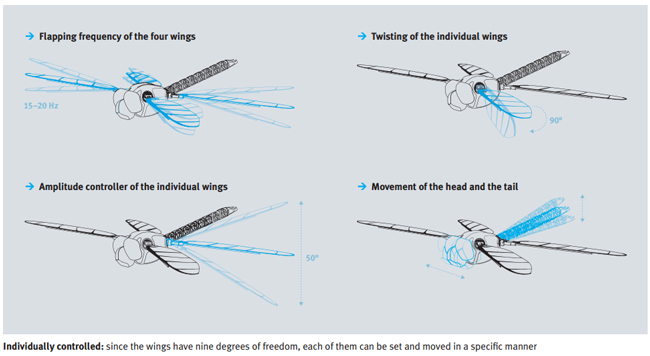 Like a real dragonfly, the BionicOpter’s wings can be turned from horizontal to vertical. Each wing is individually actuated by a servo motor during this process and twisted by up to 90 degrees (2nd, 3rd, 4th, 5th degree of freedom). Four motors at the wing joints control the amplitudes. A linear movement in the wing root infinitely adjusts the integrated crank mechanism to vary the deflection between approximately 80 and 130 degrees (6th, 7th, 8th, 9th degree of freedom). The swivelling of the wings determines the thrust direction. The thrust intensity can be regulated using the amplitude controller. The combination of both enables the dragonfly to hover on the spot, manoeuvre backwards and transition smoothly from hovering to forward flight. In order to stabilise the flying object, data on the position and the twisting of the wings is continuously recorded and evaluated in real time during the dragonfly’s flight. The acceleration and tilting angle of the BionicOpter in space can be measured using the inertia sensors. The integrated position and acceleration sensors detect the speed and spatial direction of the dragonfly’s flight. For Festo, the principle of continuous diagnostics is a guarantee of operational reliability and process stability – whether in bionic flying objects or everyday industrial use. As a global manufacturer of pneumatic and electric automation technology, Festo’s core business is helping to shape the production and working environments of the future and offers its customers innovative solutions for the production systems of tomorrow and beyond. Networking figures large in the vision of production of the future. Centralised plant control will continue its evolutionary development and, at the same time, greater use will be made of the opportunities afforded by decentralised self-organisation. Tasks that are currently still performed by a central master computer will be taken over by components in the future. Individual workpieces will themselves determine what functions they need plants to provide. This digital refinement will give rise to increasingly intelligent products that can actively support the produc- tion process thanks to increased functionality – from energy autonomy through to condition monitoring – in the smallest of installation spaces. 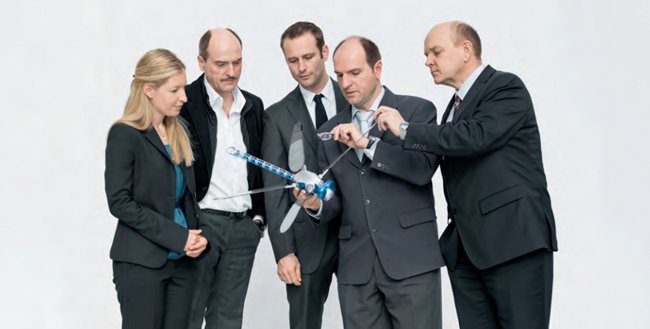 With the BionicOpter, Festo is illustrating how these aspects of integrating functions and miniaturisation can be realised. In addition, the remote-controlled dragonfly also demonstrates wireless real-time communication, the continuous exchange of information and the combination of different sensor evaluations as well as the identification of complex events and critical states. Festo’s integrated automation concept, based on the automation platform CPX, is an approach that already offers a means of achieving this. The electrical terminal CPX for valve terminals offers more than just a means of linking the field and master control levels. It has diagnostic capabilities and can provide condition monitoring functions. Its individual modules already make it possible to integrate the actuation of pneumatic cylinders via the modular valve terminals MPA and VTSA with motion controllers for electric drives. It also offers integrated safety functions. This makes it possible to access diagnostic values, locate problems quickly and replace faulty modules.